As you’ve arrive here you’ve probably already discovered peek.com and are looking for an alternative to usertesting.com their full service site. They’re both fantastic and I recommend checking them both out. Whilst offering a great service we found the pricing a little too high for our business at this time. However we have found a great lower cost alternative to usertesting.com offering a more limited (but useful) service have started arriving. The value of seeing and hearing how a real world user interacts with your website is immense. It’s arguably one of the most valuable tools in your web design arsenal. The highest quality of users with a professional backend and great service. Understandbly this comes at a cost. Whilst they have some good entry level options they’re still out of reach for a lot of small businesses & individuals. Due to their success you may have to wait between1 and 3 days for your sites user video. 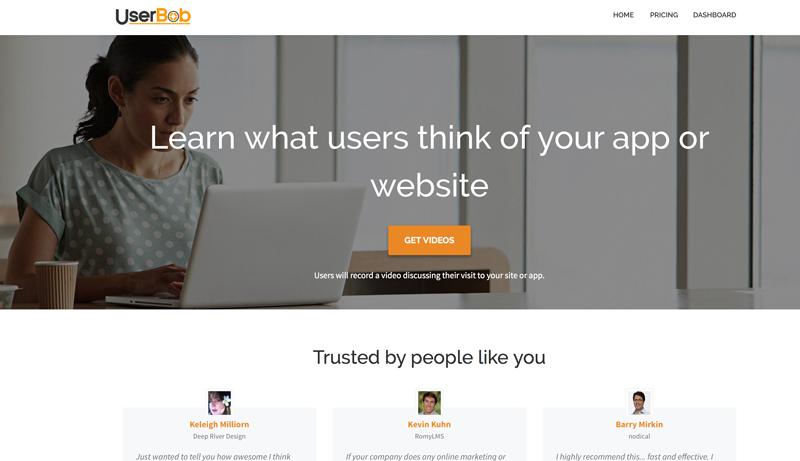 Whilst the feedback you get from userbob.com may all be full of insightful comments that are easily interpreted. It’s also likely that you’ll have to decide which bits of feedback are worth following through on. At the time of writing I think they’re a great alternative to user testing.com but the quality of the users and variety may not be quite on the target demographic you’re looking for. Though I must say we’ve been impressed ourselves so far. Obviously you don’t need to make a change to accommodate every bit of critique you receive about your website. Everyones design tastes are a little different, so try and focus on comments that would be in line with your sites target audience. Also wait till you’ve watched a number of videos before jumping in an updating your site, as it’ll soon become clear which bits of the sites user interface or copy need tweaking. I hope you’ve found this short blog post on our alternative to usertesting.com useful. If you have any other recommendation we’d love to hear them in the comments.